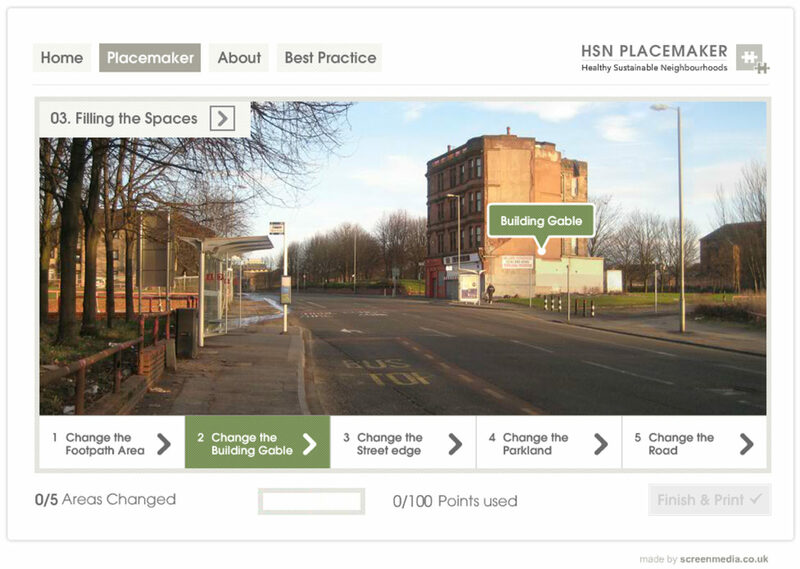 Collective Architecture and Screenmedia won the 2009 open competition to create a ‘Digital Placemaker’ for the Scottish Government (Equally Well) and Glasgow City Council. 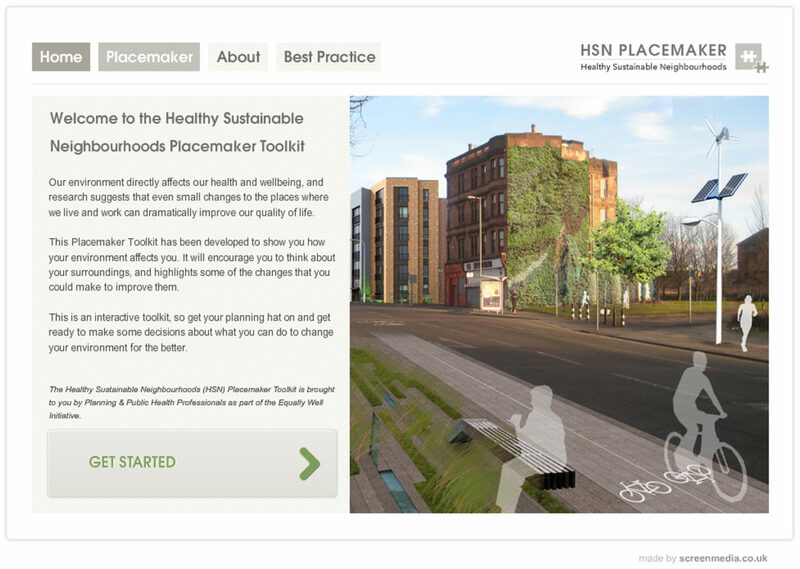 The aim of the project is to provide a digital tool that can be used to encourage communities to engage with their environment, as well as see how poor environments can be altered and enhanced through a series of transitional changes. 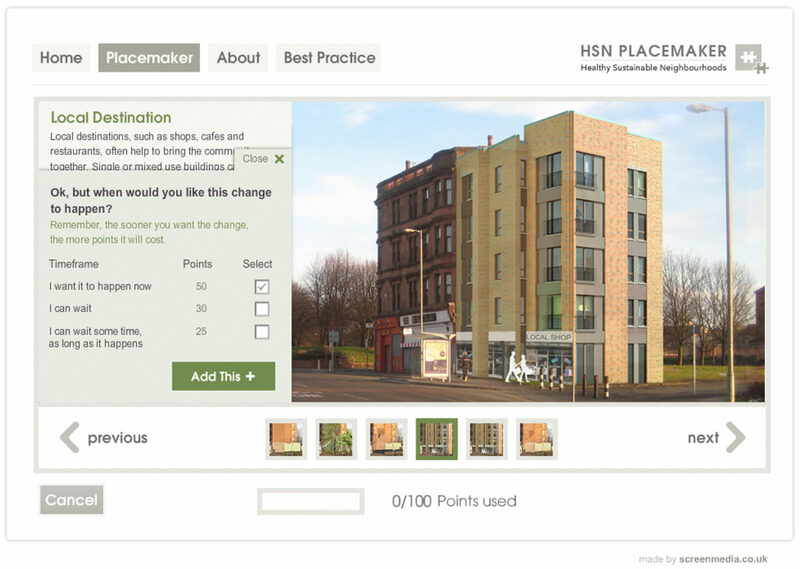 With the help of Screenmedia the final Placemaker program was developed into an Adobe Air package which could be run on any computer without the need for internet access. 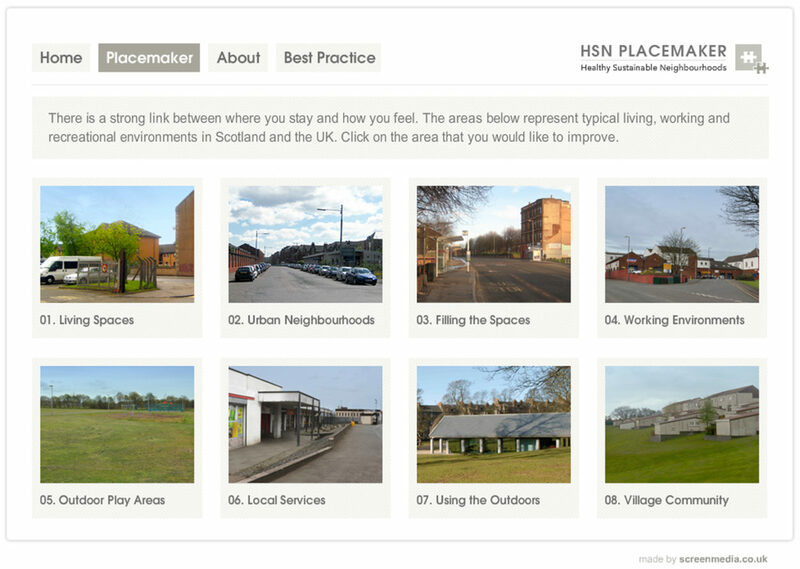 Eight sites from across Scotland were selected from the Scottish Government's Equally Well programme. The programme aims to improve population health within specific locations and make links between health with the physical environment. 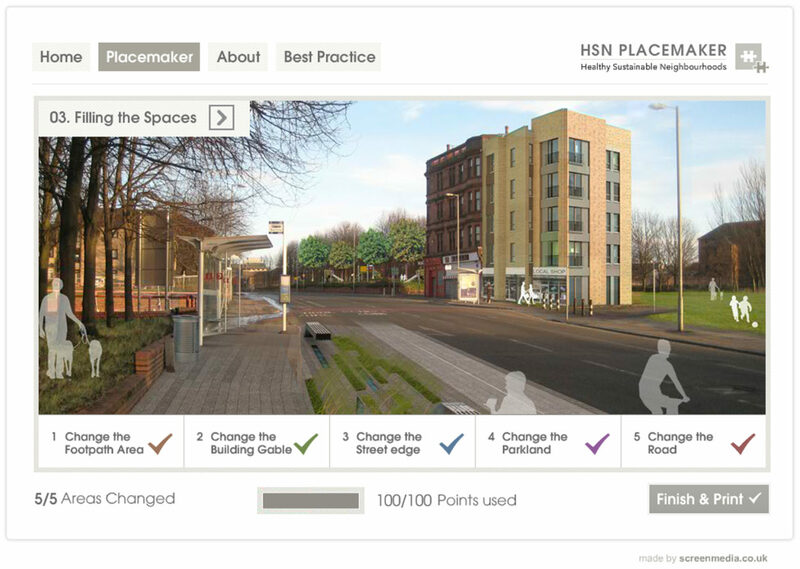 The Placemaker interface was designed to be simple, clear and easy to navigate. After the user clicks through the initial introduction screen, they are presented with the eight Test Sites. These are described under 'themes' such as Urban Neighbourhoods, Creative Play rather than geographical locations. This allows the program to be used in locations other than the specific Test Sites which might share similar characteristics and problems. After selecting a theme the user is presented with a before image with a list of hot-spots or areas for change listed along the bottom (the hot-spots can also be selected by clicking on the main image). The aim of the program is that the user will select each of the hot-spots and select from the range of options available, a change for that area within the main image. Depending on the hotspot, this could range from new paving, to a new block of flats. Each of the options contains some text explaining the advantages and disadvantages of the choices available to them. A point system has been applied to allow users to appreciate that physical changes takes time to achieve. They are limited to a set number of points to make their selections from and these are combined with a time scale in which the user would like the change to happen. At the end of the process the user is given the option to print a report which shows a before and after image. The report also provides some text explaining the choices that have been made. Reports are stored on the computer which allows a record to be retained. This allows the consultation organiser (teacher, local housing officer, planning official) to later analyse the reports and findings to inform future developments and progress.